After the ring is on, the fun can begin! And yes, we’re talking about wedding planning. Who says it can’t be fun? When you first start researching a wedding-planning timeline, it won’t be uncommon to find that most wedding pros recommend engagement photos as one of the first steps in the planning process. You might not realize it when you first get engaged, but as you dive deeper into the wedding-planning process, you’ll quickly find that engagement photos can serve a multitude of purposes. There’s nothing that will get your guests excited to book those flights and start thinking about gift ideas than a save-the-date featuring a candid engagement picture! It will remind them why they’re spending money and carving time out of their busy lives to be a part of your special day. And because weddings are all about personal touches, engagement photos will be great to have on-hand for pre-wedding festivities, such as showers or the rehearsal dinner, as well as for the wedding! Tell your love story through photos with a memorable display at the reception or get creative and use them for a unique guestbook or to decorate the reception tables. On a day that’s dedicated to celebrating your love, you deserve a photographer who can capture it authentically. And the better your photographer knows you as a couple, the better they’ll be able to capture your day. They’ll have a deeper understanding of what you’re looking for, the moments you care about, and they’ll get a feel for you and your partner’s camaraderie. And as important as it is for your photographer to know you, it’s equally essential that you get to know them as well, so schedule an engagement session, get to know each other, and practice being comfortable getting your picture taken! The camera can be unforgiving at times, and if you’re not comfortable on the other side of the lens, it’s going to translate through the photos. It doesn’t matter the length of the engagement; it’s a transitional chapter in life that’s awfully fleeting. So take this opportunity to snap some professional photos of you and your loved one before your life changes forever. For many couples, engagement photos are the first professional pictures they have taken together. And we know you’ll appreciate having high-quality photos of you in something other than your wedding attire. So years down the road when you look back on your engagement and hectic thoughts of wedding planning hog your memories, your engagement photos will serve as an endearing reminder of that special time in your life. After your engagement shoot, waiting for a link to the images to hit your inbox is the worst. But hopefully the first peek of your photos will reveal that you made the right decision in choosing a kickass photographer! But if by chance you end up not liking your engagement photos (and we’re talking more than just not liking the way your face looks in some photos) or you weren’t feeling the vibe between you and the photographer, then you still have the option to go in a different direction for the wedding day. 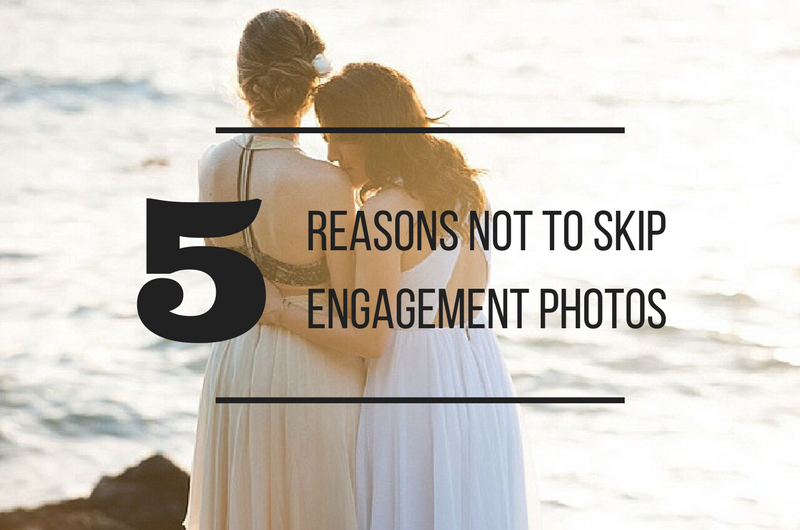 Because if you’re not happy with your engagement pictures, you run the risk of not being happy with your wedding photos either. So if anything, taking the plunge and doing a quick engagement shoot is completely worth it if it confirms that you made the right choice in a photographer for your wedding day! If you’re someone who doesn’t wear a lot of makeup or you have a tendency to be extremely particular, there’s no better time to get a glimpse of how your hair and makeup will turn out on film. Although engagement sessions tend to be significantly more relaxed, it’s a good opportunity to work with your hair and makeup artists even if you aren’t planning to duplicate your engagement photo look for the wedding day. And as we mentioned earlier, the more chances you have to get to know your vendors, the better! *Editor’s Note: This post contains affiliate links. Each time you purchase an item via our affiliate links, Love Inc. is receiving a small percentage of the sale, thus you are helping our small, equality-minded business grow and allowing us to provide more content for YOU! Isn’t that just fantastic?